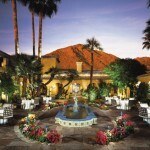 Guests are within minutes of Scottsdale and its shopping, art galleries, entertainment and world famous golf courses. 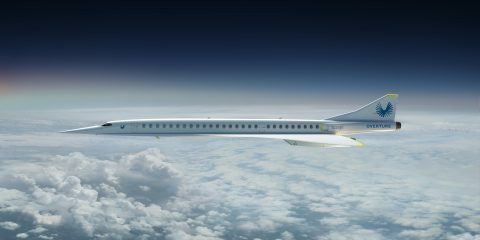 The Phoenix Sky Harbor International Airport is only 20 minutes away. Located at the foot of Camelback Mountain, the Royal Palms combines the graciousness and sophistication of a Mediterranean villa with the intimacy and privacy of a secluded retreat. Guests enter the resort through a driveway lined with regal palm trees and are greeted by a 250-year-old fountain in the circular porte cochere. Originally built in 1929 as a summer retreat for Cunard Steamship executive and financier Delos Cooke, the resort underwent a multimillion dollar restoration, re-opening in the summer of 1997. With 119 custom-appointed casitas and guestrooms, over 20,000 square feet of estate-like meeting space, Spanish Colonial architecture, Tuscan style landscaping, and superb culinary service, this awardwinning resort is the perfect choice for the discriminating business and leisure traveler, distinctive corporate and incentive meetings, and for romantic and special occasions. Inside and out, the architecture and appointments of the Royal Palms recall the glamour, hope and confidence of the Post World War II era. Situated on 9 acres filled with magenta bougainvillea, lush flower gardens and exotic plants, the Royal Palms casitas and guestrooms are each designed and decorated with exquisite care and attention to detail. Royal Palms Resort and Spa is one of more than 30 independent, upscale hotels, resorts and conference centers managed by Destination Hotels & Resorts, which is consistently rated one of the top 10 independent hospitality management companies in the United States. To protect and preserve the unique communities in which the company operates, Destination launched Destination Earth, an environmental sustainability program in 2008. Destination operates properties in key metropolitan areas and resort markets including Washington, D.C., Los Angeles, Denver, San Diego, Santa Fe, Aspen, Palm Springs, Houston and Lake Tahoe. 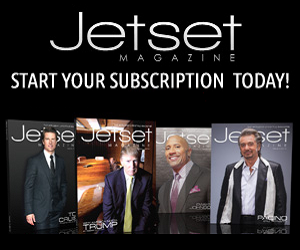 Destination is a subsidiary of Los Angeles-based investment, development and management firm Lowe Enterprises. 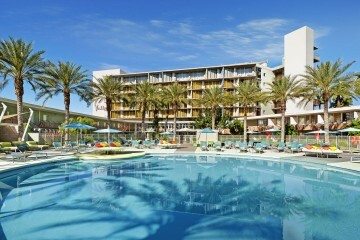 For more information on the properties in the Destination Hotels & Resorts collection, visit www.DestinationHotels.com. Delos Cooke was a New York industrialist and financier. He also held several key civilian responsibilities for which he was officially recognized by the governments of France, Italy and Great Britain. Cooke, the nephew of J.P. Morgan, sat on the boards of such companies as Chrysler Motors, the Baltimore and Ohio Railroad and the Foreman State Bank of Chicago. In the mid-1920s, when his wife Florence’s health required warmer climates, Cooke retired and moved to Phoenix. They chose a 65-acre parcel and built El Vernadero, their winter haven. The Cookes filled the 3,500-square-foot Spanish Revival villa with treasures from near and far. They were also garden lovers and used much of their annual household budget to purchase and plant rare flora, including 900 palms, many imported from Egypt. This original mansion is at the center of the Royal Palms today. After Cooke’s death in 1931, the home was sold to a series of private parties who added various rooms including an in-home chapel. Anticipating a tourism boom after World War II, a group of investors, headed by former big band leader Al Stovall, added 15 hotel rooms to the west of the original Cooke home and converted the main home into more guest rooms, a reception area and dining room. The Royal Palms Inn, named for the towering palms lining the entryway, opened to guests in the winter of 1948. Royal Palms Inn was a preferred address for travelers booking winter visits and earned a reputation when celebrities such as Helena Rubenstein and Groucho Marx, began staying at the hotel. 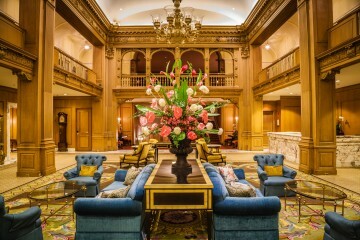 Local businessman, Fred Unger, purchased the nine-acre landmark property in 1995 and was responsible for the hotel’s restoration in 1996-1997. 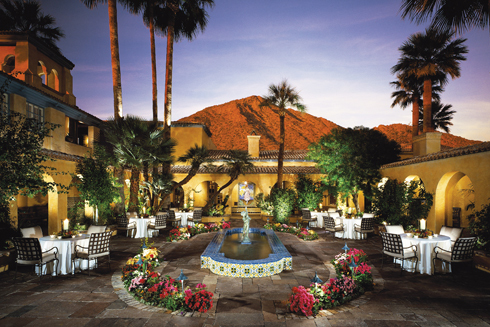 Architect Don Ziebell, president, Oz Architects, Inc., conceived the overall Spanish Colonial vision and look for the resort ensuring that the design was consistent with the architectural styling by using pale terra cotta color created through a multi-coated Italian staining process to achieve the aged patina. Joszi Meskan, Joszi Meskan Associates, designed many of the casitas, all guestrooms, T. Cook’s restaurant and bar, the Cigar Lounge, meeting rooms and public areas, and was joined by 20 ASID (American Society of Interior Designers) firms, which individually designed the deluxe casitas. Growing out of the original mansion built in 1929, the Royal Palms embodies a mixture of construction types and architectural styles. The renovated resort was modified with state-of-the-art materials while incorporating numerous architectural details to capture the feeling of the original estate. Today, the Royal Palms more resembles a huge residential manor than a commercial property. The architectural design, intimate courtyards and lush landscaping all serve to give guests a sense of serenity and privacy. The rich color scheme, antiques and plush furniture call forth images of a lavish private residence. Red brick from original walls and pre-1900 Chicago buildings. Montavista is an enclave of Mediterranean inspired guestrooms and suites overlooking a tiered garden terrace with tranquil reflecting pools and fountains, outdoor fireplaces, vibrant bougainvillea and dramatic views of Camelback Mountain. The 21 Estate Rooms offer a residential ambience accented by deep, vibrant colors and bold patterns, stylish leather chairs and ottomans, and working desks. 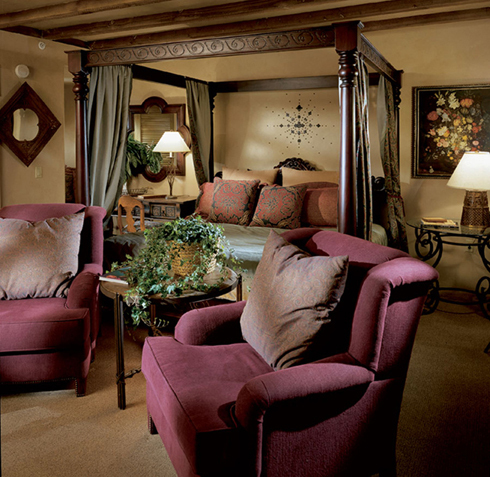 The 16 Estate Suites offer separate living rooms with queen-size sofa pullouts. A select few provide separate dining/meeting areas. Custom designed to offer a private spa environment, every detail in these six suites was meticulously tailored to appeal create a venue for tranquility and in-room spa treatments. Most of the suites have a magnificent mountain view and all overlook the Montavista Courtyard. Features include dark wood floors, furnishings of beige and white accented with sage and lavender, a fireplace, large soaking tub, steam shower, and patio or balcony. The 26 Montavista Terraces and Montavista Suites overlook the Montavista Courtyard. All are custom-designed with French doors, stylish leather chairs and ottomans, and working desks. The one-bedroom Montavista Suites are 800 square feet and most feature mountain views, terraces, living rooms with queen-size sofa pull-outs, and master bedrooms with king beds. Nestled in the west courtyard of the resort, the 17 Designer Casitas feature master bedrooms, luxurious bathrooms with a walk-in showers and separate tubs, and private patios. 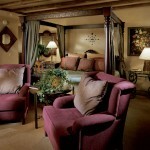 Each was individually designed with custom furnishings by members of the American Society of Interior Designers (ASID). 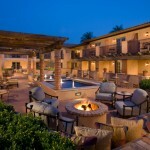 The 29 Valencia Casitas are located in the resort’s Valencia Gardens and offer guests dramatic views of Camelback Mountain or the surrounding gardens and breezes laced with citrus, French doors that open to beautiful patios and vibrant gardens, and wroughtiron four poster king or queen beds. Many have fireplaces. Set amidst lush private courtyards and colorful gardens, the four elegant Villas provide a sense of comfort and history. 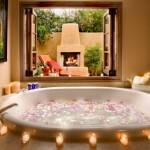 They feature king-size beds, grand scale furniture, stone floors and fireplaces, and private patios. At 1,700 or 2,300 square feet, this one- or two-bedroom villa is complete with separate living and dining rooms, a butler’s kitchen, two grand fireplaces and three private patios. The luxurious master bath features an exquisite claw-foot bathtub and a glass-enclosed indoor/outdoor shower. At 1,300 square feet, this stand-alone villa provides two-bedrooms, a parlor suite, a soothing Mediterranean décor highlighted with dark hardwood floors, crisp white linens, and accents of sage and lavender. Located next to the Alvadora Spa and the pool, the Spa Villa is designed for the pampering and relaxation of in-room spa treatments. The parlor provides a comfortable seating area and an expanded patio with an intimate fireplace. Each bedroom has its own private bathroom featuring a Kusatsu deep European soaking tub, a stand-up indoor steam shower, an outdoor shower and a private patio with fireplace. The 900 square-foot Camelback Villa features Old World charm and comfort and features living room, dining room, butler’s kitchen, a glass-enclosed indoor-outdoor shower and an expansive private patio with fireplace. A daily $28.00 nightly resort fee is added to the final check-out invoice to cover a number of services. Under the direction of Executive Chef Lee Hillson, Royal Palms offers one of Phoenix/Scottsdale’s best restaurants with T. Cook’s. 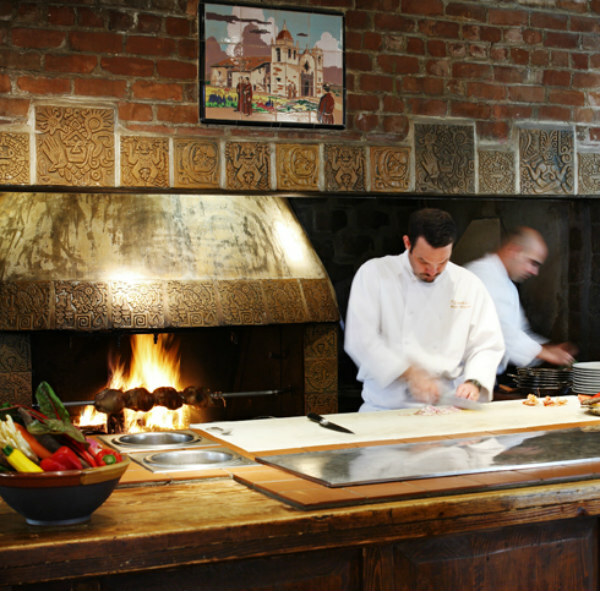 The restaurant offers artistic, intriguing Mediterranean style cuisine with rotisserie specialties prepared at the restaurant’s centerpiece 1930’s fireplace. Desserts and pastries are exquisitely prepared by Pastry Chef, Travis Watson. His chocolate of choice is Valrhona from France and he uses fresh citrus from the resort’s groves. Watson focuses on simple elegance but he’s no stranger to creating show-stopping sculptures made with chocolate or sugar. 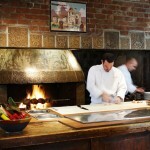 T. Cook’s location in the mansion creates a residential dining experience, comfortable yet elegant. A vaulted wood-beamed ceiling, dramatic wrought iron chandeliers, and iron floor lamps enhance the intimate atmosphere with soft lighting. Floor-to-ceiling windows offer stunning views of Camelback Mountain. Two patios adjacent to T. Cook’s are available for enjoying the Arizona outdoors. 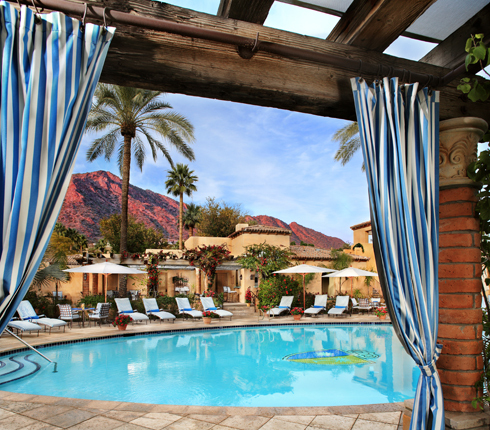 One offers year-round al fresco dining in comfort with ceiling fans, awnings and a misting system for warm weather; a heated floor and fireplace for cooler temperatures; and a stunning daytime view of Camelback Mountain as well as a front row seat for vivid mountain sunsets. Located off the Courtyard, this cozy lounge features a 30-foot cherry wood bar with seating for 13, and 1930s style bamboo sofas and leather overstuffed chairs. Rich and inviting, it contains French terra cotta tiles on the floor and hand-painted Italian frescos in epic-like maps on the walls. A black baby grand piano provides entertainment. A private dining room seating 12 guests, the Delos Room features antique sideboards with Italian and French pottery, artifacts from around the world, and a large wicker chandelier, which serves as a perch for a whimsical wicker monkey. Located adjacent to the swimming pool, the Cabana Grill serves a light fare of salads, sandwiches and beverages to guests who choose to dine al fresco or in the poolside cabanas. Room Service: Available from 6:00am to midnight. 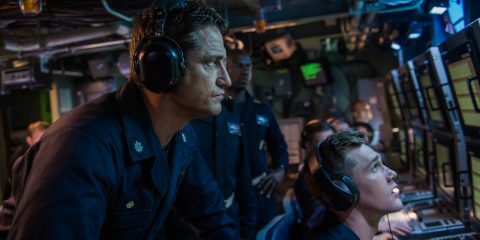 Robert Vickrey’s role goes far beyond ordering flowers and making dinner reservations. 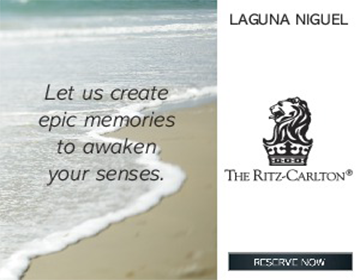 He creates WOW experiences by orchestrating every detail of a memorable evening. Among his favorite venues for a romantic rendezvous are the Alegria Garden, the Cervantes Library, the Mansion Courtyard and the Bell Tower. 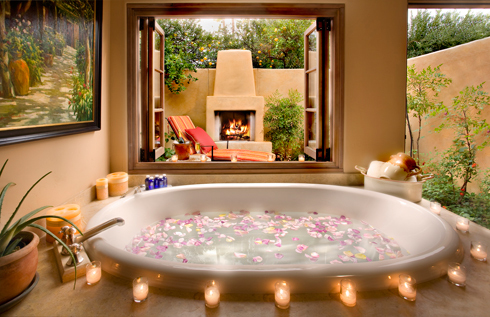 Mirroring the Old World feel of the resort, Alvadora Spa is residential, warm, intimate… and even romantic. Distinguished by the Spanish Colonial design of the hotel coupled with distinctive European influences, the spa integrates the indoors and outdoors in a unique non-clinical environment. Features include natural stone, aged timbers, rich colors and textures, residential furnishings, hand-made tiles, large wooden doors, gardens, fountains and fireplaces. The spa has ten treatment rooms plus a variety of outdoor treatment areas in garden settings with fireplaces and fountains, a fitness center and full-service salon. Named “Best Reception for Small Weddings” by Arizona Bride magazine, Royal Palms’ aura of romance makes it the venue of choice for local and destination weddings. The intimate, residential feel, combined with the cultured, aesthetic design and architecture, lends itself perfectly to all functions associated with weddings, including the ceremony, reception, rehearsal dinner, bridal lunch, and showers. Royal Palms is the optimum choice for those who prefer the personal feeling of home with the polish of a fine resort. Each of the many venues has a uniquely intimate atmosphere with ornate décor, antique furnishings and accessories, vibrant gardens, indoor and outdoor fireplaces and stunning views of Camelback Mountain. Nancy Shina provides custom shopping tours for resort guests, offering her insider’s knowledge of little known boutiques, specialty stores and unadvertised sales. 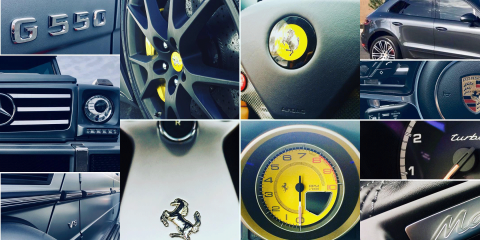 Her chauffeur-driven excursions treat guests to VIP in-store receptions, exclusive trunk shows, and red carpet shopping for individual guests or for groups of friends, wedding parties or business meetings. Unlike typical meeting facilities, guests will immediately know they are somewhere special when they attend a meeting at the Royal Palms. Wall tapestries, antique furniture, huge stone fireplaces, views of tranquil gardens and natural lighting from the numerous Mediterranean arched windows and doors give conference attendees the feeling that they are the honored guests of a grand estate. Food service for all meetings is overseen by Executive Chef Lee Hillson, and prepared “a la minute.” Entertainment, transportation, events, off-site activities and communications services are provided by the Conference Services and Royal Destinations departments. This 2,450-square-foot room accommodates up to 300 for a reception, 180 for dining and 280 theater style. It opens to a patio (200 for a reception and 50 for dining) and a garden (100 for a reception and 60 for dining). This 2,120 square-foot room with an attached pre-function foyer accommodates 220 for a reception, 140 for dinner and 200 theater style. The adjacent lounge and patio accommodate 250 for a reception and seat an additional 120 guests for dinner. 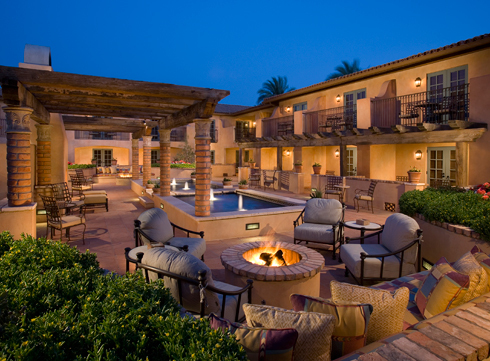 The Palmera Garden features a private patio and fireplace and accommodates 50 for a reception. 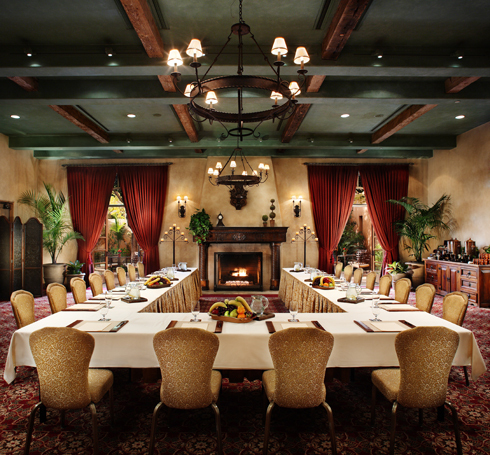 For smaller gatherings, this room accommodates approximately 50 for a reception, 40 for dinner. 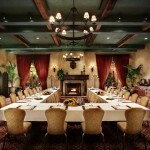 A comfortable “living room” venue for a reception of up to 40, it features an antique fireplace, bar and book-lined walls. The Vernadero Boardroom seats 18, and the adjacent Vernadero Lawn accommodates 200 for a reception and up to 160 for dining. The Alegria Garden accommodates 80 for a reception and 60 for dining; the Alegria Lawn, 150 for a reception and 140 for dining. The Royal Palms offers a swimming pool lined with Mother of Pearl tiles and surrounded by private cabanas, a whirlpool spa, and croquet lawn. The Concierge staff will arrange for golf at nearby championship facilities, bicycling, hot air balloon rides, desert jeep rides and excursions to museums, attractions and abundant nearby shopping. The proximity of Camelback Mountain offers guests the opportunity to hike in one of the most beautiful areas of the city. Resort guests have an opportunity to play golf at any one of the five legendary Troon courses, including Troon North, Kierland and Talking Stick. Troon North, acclaimed as one for the country’s premier golf courses, is an exclusive, members-only club…except for the guests of Royal Palms; Resort guests receive advanced preferred tee times.